Singapore Athletics Association (SAA) intends to nominate 7 athletes for the Youth Olympic Games Asia Qualification 2018 (YOG-AQ). A maximum of two athletes from any one Member can compete in each event. The tentative travel dates will be from 2nd – 6th July 2018. The qualifying period lasts from 01.01.2018 until 28.05.2018. 3.2	Only athletes aged 16 or 17 years on 31 December 2018 (born between 1 January 2001 and 31 December 2002), may compete in any event. SAA will not be able to consider the athlete for YOG-AQ, if the requested training program is not send to SAA by 30.04.2018. 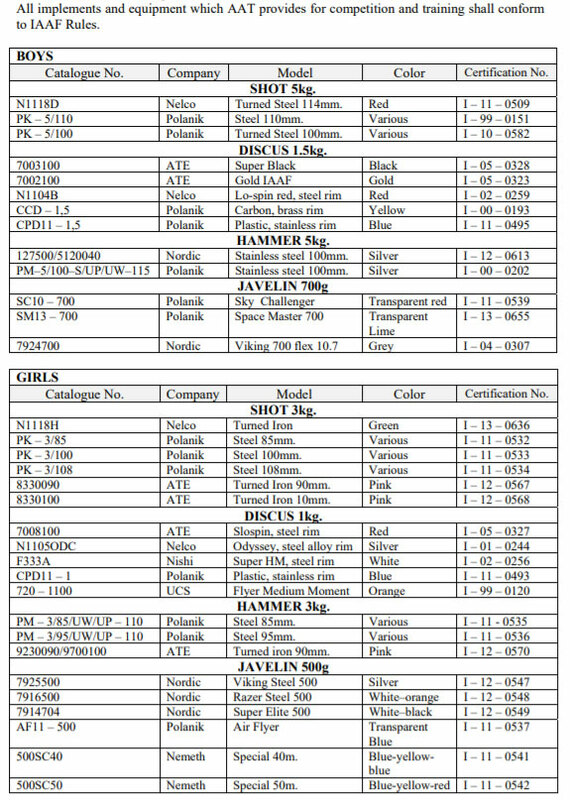 3.9	Not used or administered any substance which if it had been detected as being present in the athlete’s body tissue or fluids, would have constituted doping, or used any prohibited method or committed any other doping offense as defined in ADS’s, WADA or IAAF’s Anti-Doping By-law. 4.1	All achievements submitted for consideration should have taken place at SAA/IAAF sanctioned championships and trials, but athletes may submit the achievements from overseas championships and meets of athletes studying in overseas tertiary institutions. However, these have to be properly accredited and sanctioned to be accepted (written confirmation by SAA upon sending an email to SAA). 4.2	Achievements from overseas championships have to be properly accredited and sanctioned to be accepted. However, these have to be properly accredited and sanctioned to be accepted (written confirmation by SAA upon sending an email to SAA). 4.3	For 100m, 200m, 100m / 110m hurdles, long and triple jump events: only performances with legal wind-speed will be accepted. 4.4	For all track and road racing events: only performances measured by using an electronic timing system will be accepted. Road performances will be accepted for race walk. In the event that a selected athlete decides to withdraw from the competition (unless injured, proved by medical certificate) more than three days after SAA announced the final lists of participants, the athlete has to bear the full costs (air tickets, insurances, accommodation or other costs) that SAA has paid for the trip. No replacement will be made for last minute withdrawal. Only athletes who have submitted their registration form to SDP in time will be considered to participate in the YOG-AQ. SAA will select the seven (7) athletes, who show the best performance in their respective events related to the standards mention in Table 1. In addition, SAA will nominate the Gold medal winners (1st place) of the 2018 SEA Youth Athletics Championships. No additional athletes will be nominated in case the Gold medal winners are within the above-mentioned number of seven athletes. 8.1	The first [1st] and second [2nd] ranked athletes in the 2018 season’s ranking (01.01.2018 – 28.05.2018, comprising competitions mentioned at 5) for all events will then be selected for YOG-AQ nomination. 8.2	In case there is a tie between two or more athletes, SAA will compare and choose the athlete’s 2nd best performance and so on, achieved in the respective period (comprising competitions mentioned at 5). 8.3	The nomination panel reserves the right not to nominate an athlete/team to represent Singapore in the YOG-AQ if, in its sole opinion, the athlete/team concerned cannot meet the fitness and performance targets set by SAA. 9.1	Based on the results of the past two IAAF World U18 Championships each continent (refer to table 8.1.1) will be allocated a number of quota places ensuring the maximum quotas per event are respected and universality respected through the continents. 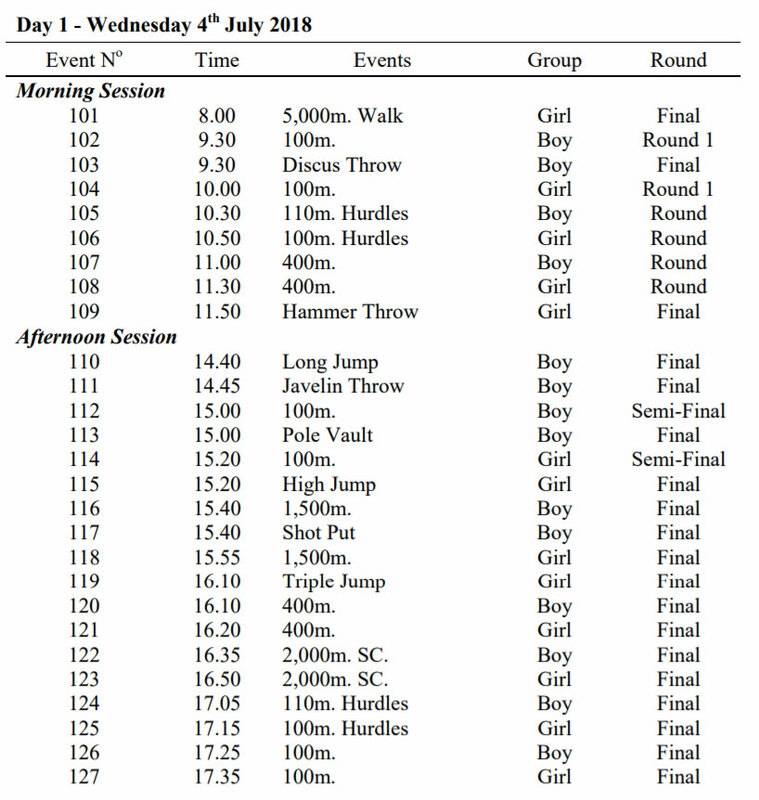 9.2	The top ranked athletes at the respective Area/Continental Youth Championships (or selection competitions or approved selection criteria) from each are per event according to table 9.2.1 will be allocated a quota. 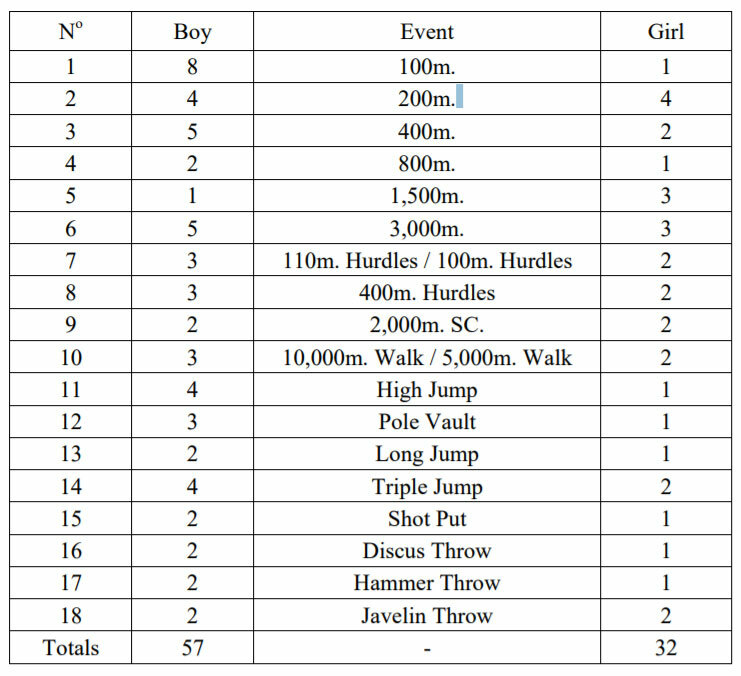 The table below outlines the quotas set by IAAF for Asia Qualifiers using the results of the past two IAAF World U18 Championships. 9.3	The maximum number of events in which a youth athlete can compete is two individual events. 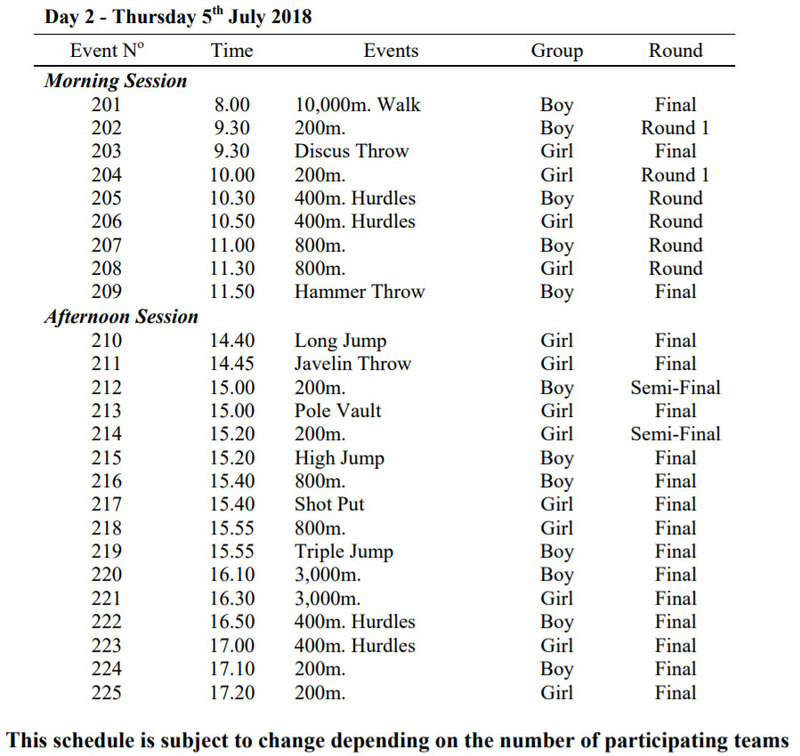 If the two individual events are track events, only one of these may be longer than 200m. 9.4	The 1500, 3000 & 2000SC events will consist of two stages. Athletes will compete in their track event as well as a cross country event (4-6km). In case no Singaporean athletes qualifies through the YOG-AQ, SAA deserves the right to nominate one athlete to participate in the YOG based on a wildcard. SAA intends to nominate this athlete to the YOG, who shows the best performance in the period of 01.01.2018 until 15.07.2018 in relation to the standard mentioned in Table 1. Final approval of this wildcard is up to IAAF. 10.1	The Technical Director or another staff member of SAA’s sports development and performance team may be the Head Coach / Team Manager for YOG-AQ if there is a need for a Head Coach / Team Manager. 10.2	The number of team coaches selected will depend on the number of athletes selected and will be determined by the number of accreditations provided by organiser. 1st priority:	One [1) coach for each of the event groups (sprints / jumps / pole vault / throws / middle & long distances + race walking) in which Singaporean athletes are competing at. The coach who is dealing with the highest ranked athlete will be selected first. The coach who is dealing with the next ranked athlete in another event group will then be selected as the 2nd coach (and so on). 11.1	Where there is a conflict or dispute in respect of these Guidelines for the nomination of athletes to represent Singapore in the YOG-AQ, SAA reserves the sole right to interpret this document and to use its discretion in the resolution of the matter in conflict or dispute. 11.3	Athletes may only appeal on the grounds that the nomination event was not executed in accordance with its notice of race or the nomination process was not carried out in accordance with this policy document. 11.4	The Athlete Selection Appeals Standing Committee made up of three MC members who are not part of the nomination panel to hear the appeal within one week of receipt. 2. The Honorary Secretary General immediately informs the Athlete Selection Appeals Standing Committee. The Athlete Selection Appeals Standing Committee shall convene its first hearing within seven (7) days from receipt of such notice. 4. The Athlete Selection Appeals Standing Committee will give its decision as soon as practicable after the hearing and will provide their decision to SAA’s MC and the Sports Development and Performance team and the appellant with a statement of the reason for its decision. Based on the average of 2010 & 2014 Continental Qualification results given by the 2018 Continental Quota allocated (table 9.2.1) placing.